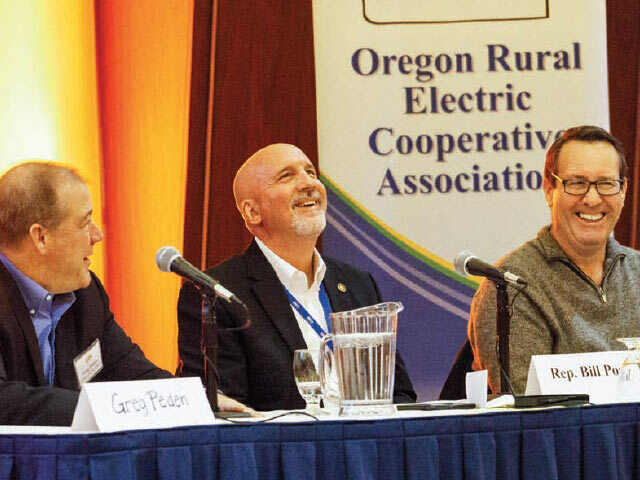 Legislative panelists Greg Peden, Rep. Bill Post and Rep. Paul Holvey share a light moment at the Oregon Rural Electric Cooperative Association’s annual meeting. 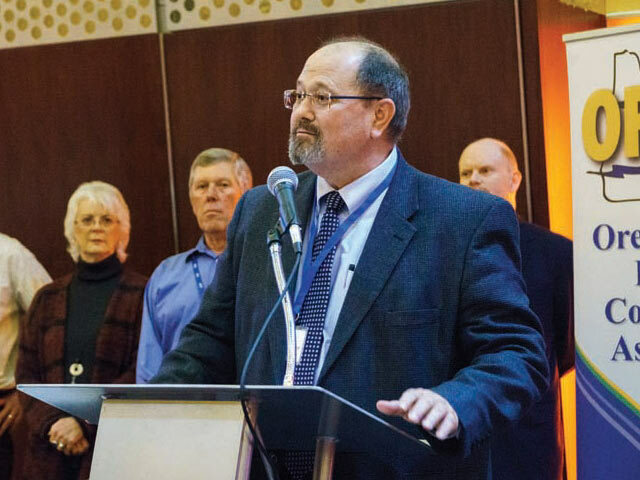 In December, Oregon rural electric cooperative leaders met in Salem to discuss trends in rural Oregon and in the electric utility industry, as well as to honor those who made an invaluable contribution to the cooperative movement. The theme of the meeting, “Going for the Gold Every Day,” was a nod to Oregon co-ops’ pursuit of excellence, and also to the meeting’s keynote speaker: nine-time gold medalist and swimming legend Mark Spitz. After a compelling presentation by Linn County District Attorney Doug Marteeny on crime in rural Oregon, politics took center stage as panelists attempted to dissect one of the most contentious elections in the nation’s history. Dan Lavey, president of Gallatin Public Affairs and one of the preeminent campaign strategists in the state, offered his viewpoint on why Donald Trump upset Hillary Clinton and what it means for Oregon. In the next four years, they should rename Oregon the ‘State of Resistance,’” Lavey said, concluding that President-elect Trump’s policies will face fierce opposition in Oregon’s urban areas. An informative legislative panel that included Rep. Paul Holvey (D-Eugene), Rep. Bill Post (R-Keizer) and lobbyist Greg Peden explored the upcoming 2017 session in the Oregon state capital. The panelists discussed the defeat of Measure 97, a controversial tax measure that would have raised $3 billion in revenue. Post displayed a map showing how Measure 97 failed in the rural counties. He said it is the responsibility of state agencies to justify their budget increases. “We need to ask why they need an increase,” Post said. Holvey—who co-chairs the Joint Interim Committee on Department of Energy Oversight—also outlined some of the panel’s recommendations, including the creation of a board to ensure accountability. The special committee met throughout the year after a series of scandals and mismanagement allegations rocked the department. The meeting also focused on regional energy issues, including a talk by Henry Lorenzen, a former co-op attorney who now chairs the Northwest Power and Conservation Council. “It feels like old-home week,” said Lorenzen, as he made a case for conservation among the utilities. Conservation and solar energy were key topics during an expert panel moderated by Lane Electric CEO Matt Michel. PNGC Power CEO Beth Looney, Jeff Bissonette of the Solar Energy Industry Association and Brendan McCarthy of Portland General Electric participated in the discussion that centered on dynamic changes in the electric utility industry. To conclude the annual meeting, the ORECA Board of Directors honored electric co-op leaders for outstanding achievement. Julie Stephens of Lane Electric took home the Rural Electrification Award. Former Oregon Trail Electric Cooperative CEO Werner Buehler received ORECA’s highest honor: the Distinguished Service Award. Werner Buehler, former CEO of Oregon Trail Electric Cooperative, received the ORECA Distinguished Service Award, the highest honor given by the association. The meeting concluded with Central Electric CEO Dave Markham accepting the prestigious “ACRE Power Hitter” award. “Central Electric has a great culture of political activism,” announced ACRE Chairwoman J. Ingrid Kessler as she presented the coveted baseball bat. Markham challenged other co-ops to “try and take the award away from Central” in an effort to build political strength among Oregon’s co-ops.